There appear to be a lot of fiber artists on the forum. 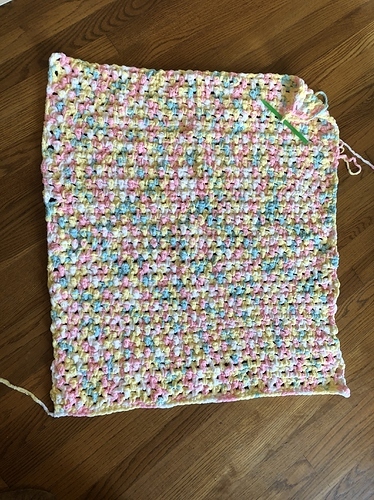 I am new to the fiber arts and really enjoying crocheting so far. I may wander into the knitting realm eventually, but I’ve found I already have a long list of patterns for crocheting I would like to try. I thought It would be fun if we had a place we could share what we are currently working on (fiber or other art forms! ), also knows as our work in progress (WIP). This could turn into a fun resource for inspiration (be sure to share your source, if you have one!) and also a helpful place where if someone is stuck, they can come to ask for help. 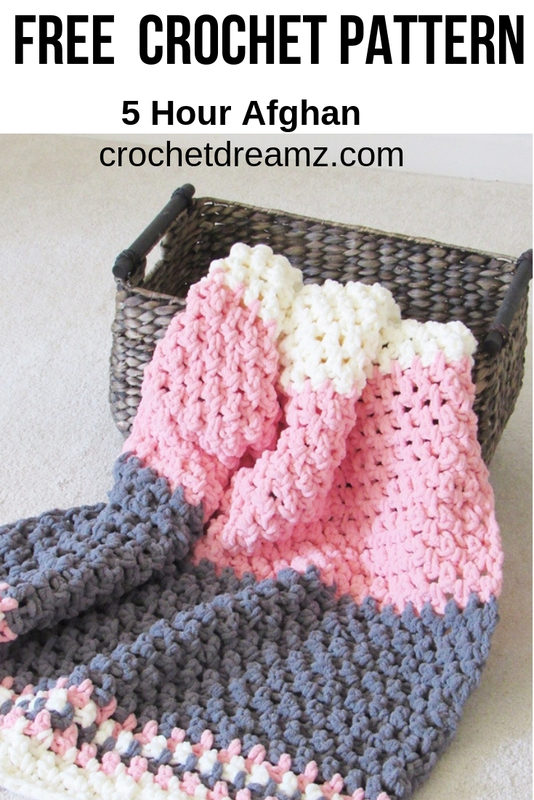 This free crochet baby blanket pattern works up in under 5 hours. You will love the texture and the softness of this blanket. Make one today! Yay for this thread! Excited to see what everyone is working on! I’m trying to do some stash busting so I’m making Bobbin some baby leg warmers. I don’t have dpn’s or circulars small enough to use so I’m knitting them flat and seaming them. Not ideal but I didn’t feel like buying more needles. Yarn is Ms Babs Yowza I think. Pattern is a mishmash of what I saw on Ravelry for this kind of project. 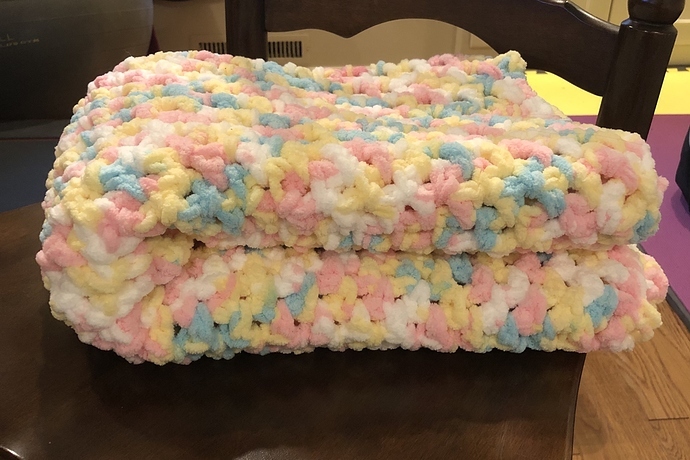 A baby afghan I crocheted for a friend recently. 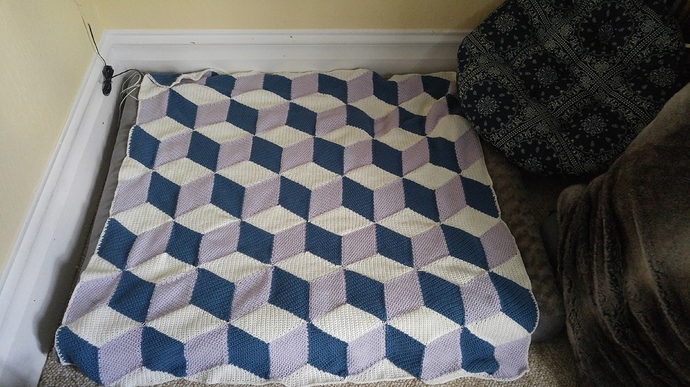 The edges are deeply non-perfect, but I adore how much this pattern really does look like building blocks! All your projects look so good! Is this space open for non-fiber work WIPs? I updated the initial post to be more inclusive! 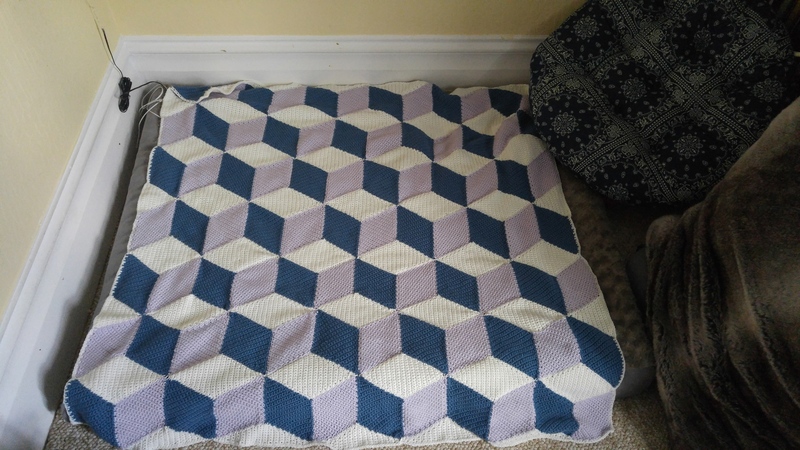 The block afghan is AMAZING!! Did you work from a pattern? I think I need to add this to my list. I did! It’s super easy, and I think could make a great second project for someone with a little ambition. 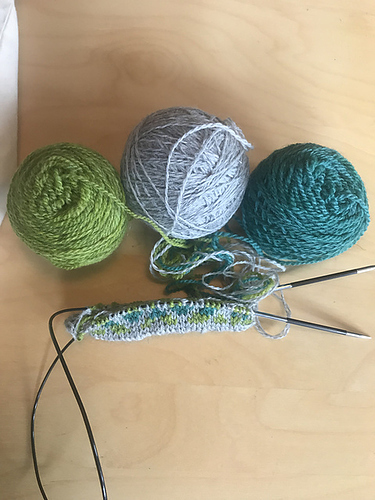 It’s all diamond motifs done in single crochet, so the only part that’s not super beginner friendly are the decreases and increases. I will say that sewing all the motifs together is insanity-inducing, but it makes a gorgeous end project. These are all gorgeous. 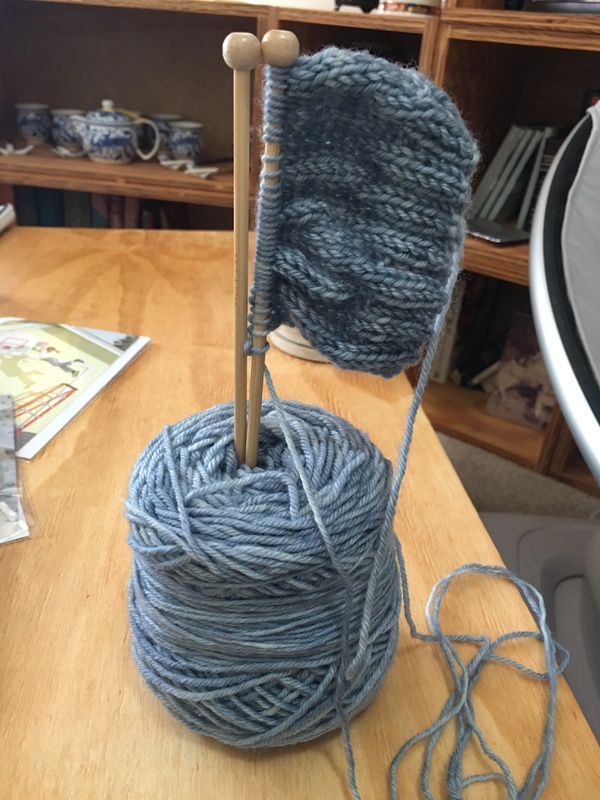 I haven’t knit in years but the most advanced stage I got to was a “~sweater~” that uhh… definitely had a neckhole. Yessss I love knitting/crafting chat. 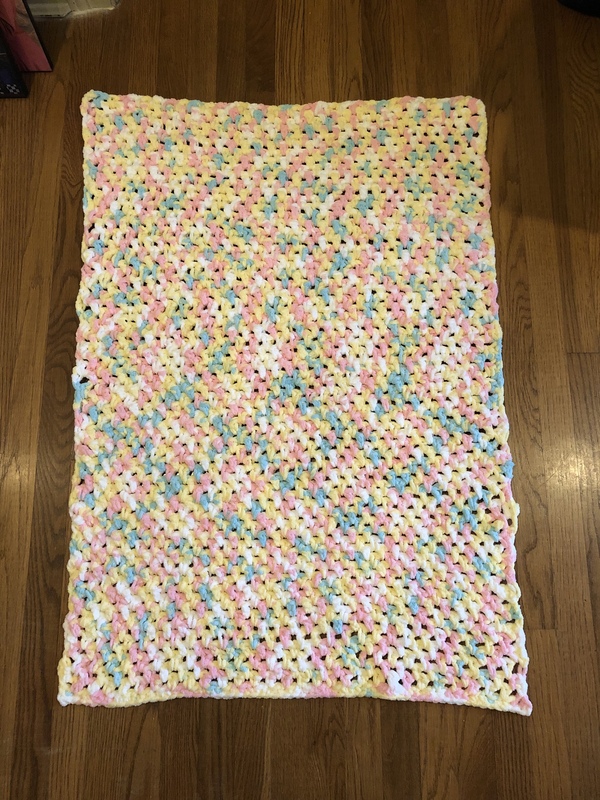 Anyone want to be ravelry buddies? I’m ielerol there too. I have too many WIPs, because I’ve had a hard time focusing on a single project lately and just getting it done. But here are photos of the ones I’ve been most active on lately. The first is this sweater for myself. 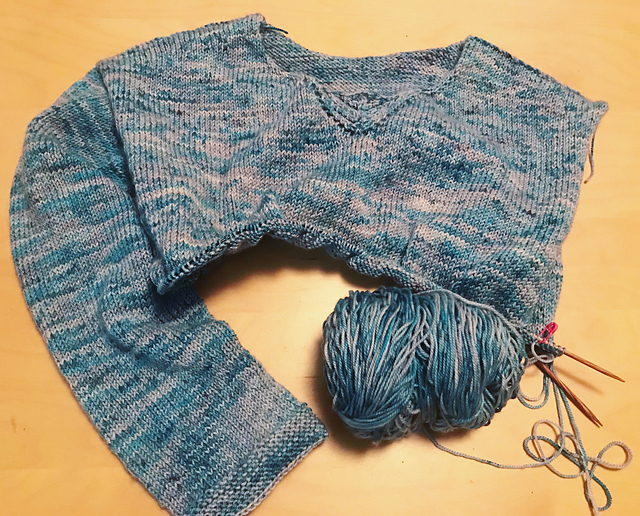 The last sweater I made, the second sleeve took me longer to complete than the whole rest of the sweater entirely, so for this one I’ve been kinda alternating between working on a sleeve and the body, and that worked for awhile. 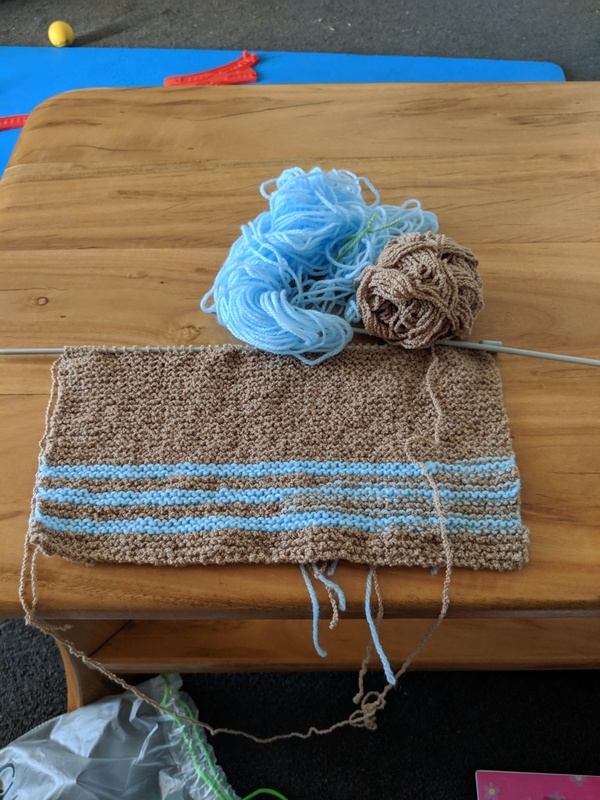 I’m now a couple inches into the second sleeve and feeling unmotivated again. Perhaps I will make myself vests and short-sleeved tops in the future. 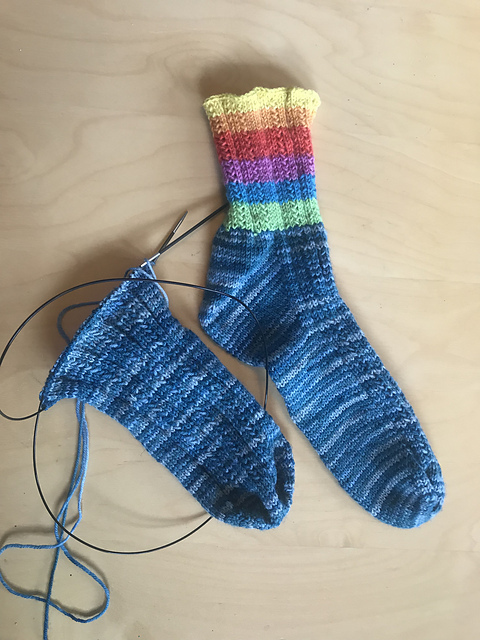 I was making steady progress on these socks until I thought it was a good idea to practice continental knitting with those tiny sock needles, and had to take a break due to pain. And this is how far I got into my latest stranded colorwork project before declaring I would lose my mind if I didn’t figure out a better way to handle it, thus the attempt at continental knitting. I am proud of the yarn for this one though, I had a lot of that gray yarn leftover from a previous project, and dyed the green and turquoise myself with easter egg dye tablets so I could use it for colorwork. I made that same hat! And stranded tension always looks wonky before you block it, I bet that will even right out with a good block. I usually don’t bother to block hats, but it really transforms stranded colorwork. This is so cool! How colorfast are the egg dye tablets? I could feel the stitches being tighter in this hat; I hope that they’ll even out with a wash and a block. 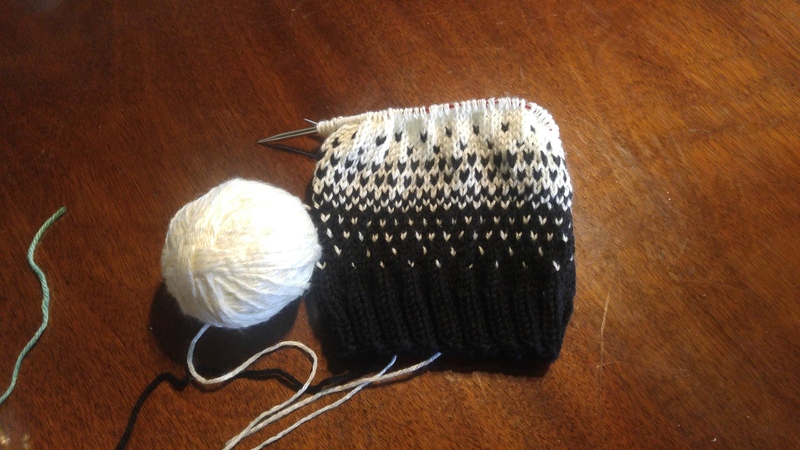 The yarns are also slightly different weights, so the ombre transition interacts with that as well – of course the black stitches stand out more against the white background, the black yarn’s a little fatter and it stands up more. I’ll probably do another hat in white-to-black transition instead of black-to-white to use up more of these two balls. @Oro I personally enjoy seeing non-fiber WIPs too, but I am always happy to defer to OP’s wishes! My understanding is that some food-safe dyes are better-behaved than others, but in general as long as you’re careful about setting the dye correctly (heat + acid + time) they hold up to washing quite well. Food color tends to fade in sunlight more quickly than commercial dyes, but everything will fade in sunlight eventually. The What A Kool Way to Dye ravelry group has lots of good info if you’re curious to learn more. 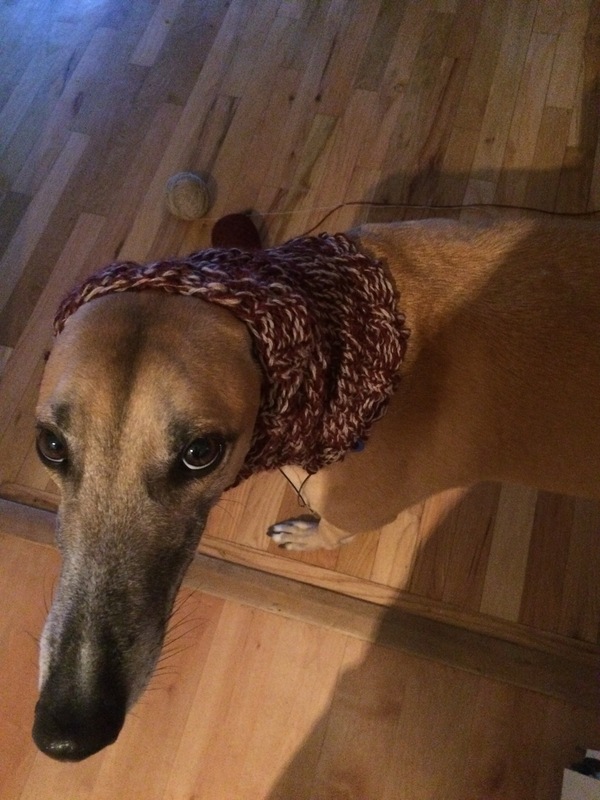 A head warmer for my dog. Reluctantly modeled by the recipient. Sharp eyes may note the balls of yarn he got himself tangled up in trying to escape the photographer. Ooo, I’m interested to see how that turns out! I’ve been looking at amigurumi crochet patterns but I am VERY intimidated. Have you done increases/decreases yet, QA? My very first project was a chevron pattern scarf, I think that has increases and decreases. I had to sc2tog, this is an example of a decrease, right? and also sc 3 in one st, which would be an increase I think? Finished the baby blanket last night and weaved in the ends this morning. I decided to just use up 2 skeins of the bulky yarn instead of trying to hit exact dimensions. It turned out to be 29x42.